Jack Dempsey: Test-match heavyweight, or just a pumped-up middleweight? Jack Dempsey was the ‘stage name’ of one of the most charismatic and memorable heavyweight boxing champions of the 20th century. It was coined after Jack ‘Nonpareil’ Dempsey, a popular middleweight champion of the time. William Harrison Dempsey (as he was baptised by his Mormon parents) first adopted the soubriquet as an emergency replacement for his brother Bernie, who backed out of a fight with one George Copelin after learning that his opponent had once sparred with all-time great Jack Johnson. Dempsey climbed into the ring knowing that his opponent outweighed him by at least ten kilos but that did not stop him knocking Copelin down eight times in the first two rounds before the referee finally called a merciful end to the beating in the seventh. When Dempsey eventually challenged for the world heavyweight title five years later, in 1919, he was facing even more unfavourable physical odds. His opponent was the hulking six feet seven inches, 112 kilo Jess Willard, one of whose previous opponents had died in the ring. Dempsey himself entered the ring six inches shorter and 28 kilos lighter than Willard, but once again the bigger man was destroyed by Dempsey’s punching power. Willard was knocked down seven times in the first round, and suffered a broken jaw, several broken teeth and fractured ribs en route to a third-round stoppage. The joke doing the rounds in boxing was that Dempsey’s manager ‘Doc’ Kearns had blown up a natural middleweight and made him the heavyweight champion of the world, and the ex-champion Johnson would later call him out for hand-picking “110-pound starlets” as his opponents during his reign as champion. Dempsey was at heart a rough-houser with a cheerfully realistic sense of humour about himself: “I can’t sing and I can’t dance, but I can lick any SOB in the house” and “Tall men come down to my height when I hit ‘em in the body” were just two of the one-liners which have passed from his lips into boxing folklore. Dempsey enjoyed the kind of humility which comes from a small man’s success in upsetting the odds, and it is hard not to believe that his namesake has a chance to do exactly the same as the Wallabies’ current number 6. Furthermore, all of Australia’s main opponents on the end of year tour (Wales, England and Scotland) are almost certain to field bigger back rows than the Wallabies too. So can Jack Dempsey punch above his weight and upset the odds, starting with the third Bledisloe match in Brisbane next weekend? 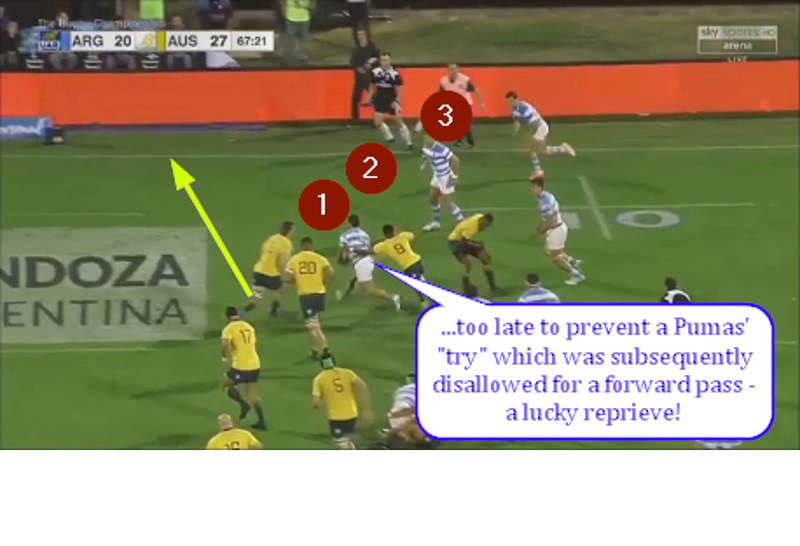 The signs from the final round of the recent Rugby Championship in which the Wallabies overcame Argentina, were encouraging. Jack Dempsey made his tackles, except for one important defensive misread towards the end of the game, he won all of the lineouts thrown to him and his ball-carrying was especially effective. Noteworthy is the low ratio of errors, a highly-important quality at international level. 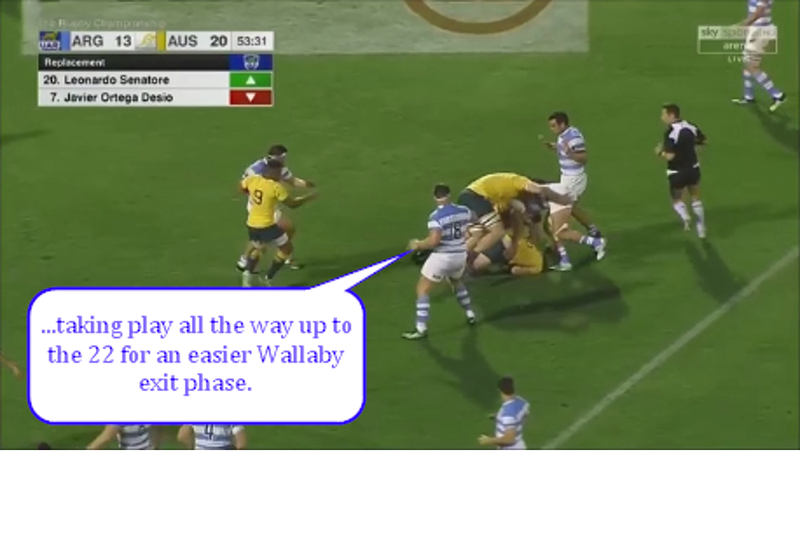 Both the Wallaby lifters are at maximum reach as the ball reaches Dempsey, and his arms are also fully-extended towards the throw – this is good technique all-round. Instead of playing within a set pod with a defined role, Dempsey is trusted to make a decision – whether to go forward and lift for Rodda, or turn and boost Coleman behind him. 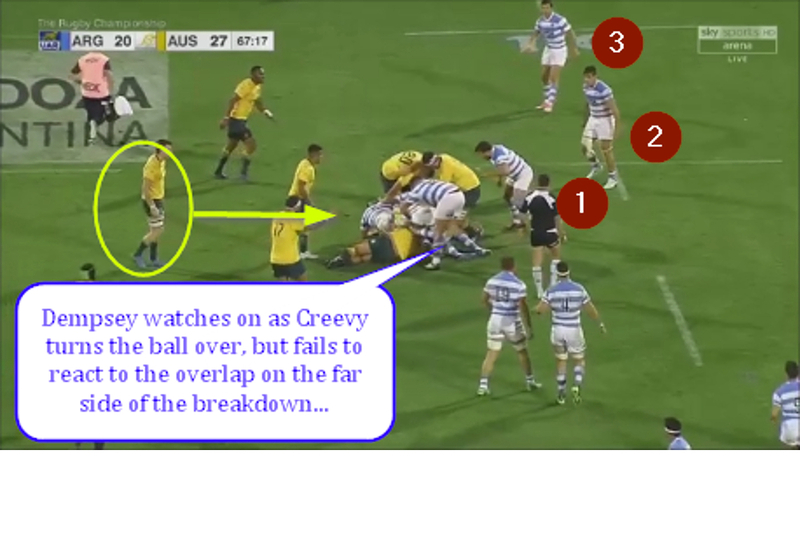 At scrum-time, he was likewise trusted to move to number 8 in the final quarter of the game, at a stage when the Wallaby scrum was beginning to struggle. The single most impressive aspect of Jack Dempsey’s performance against the Pumas was his ball-carrying ability. All of his fourteen carries had positive results in terms of yardage and/or speed of delivery (1-3 seconds) from the ruck, and he had two clean breaks and two tackle breaks to boot. Those five metres make all the difference between a hard and an easy exit! 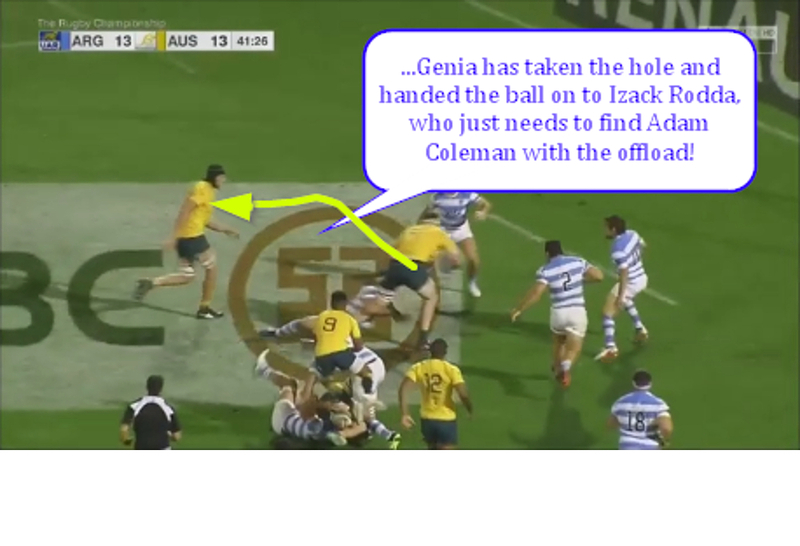 If Rodda can find his second-row partner Coleman with the final pass in contact, Coleman is very likely to plough through the Puma #9 Martin Landajo and score this close to the Argentine goal-line (Rodda has since been ruled out for the rest of the year). One of the bonuses in Dempsey’s inclusion is the license it gives Sean McMahon to play in the role in which he is arguably most effective – out wide as the “1” in the 15-metre zone in the 1-3-3-1 formation. 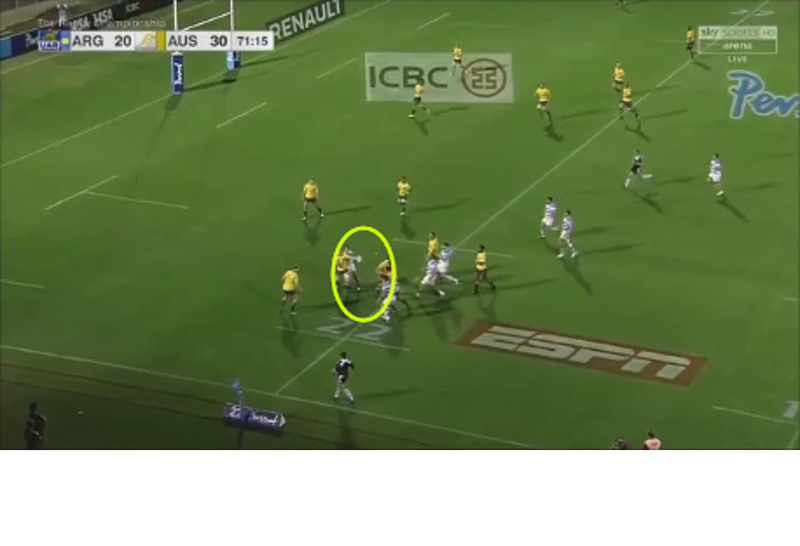 The most seminal example of the Dempsey/McMahon combination was in the build-up to the Wallabies’ first try in the 19th minute. Mistakes began to proliferate in the last quarter of an hour, when Jack Dempsey was clearly ‘out of gas’ but required to stay on the field with back-row sub Lukhan Tui coming to replace Sean McMahon instead. 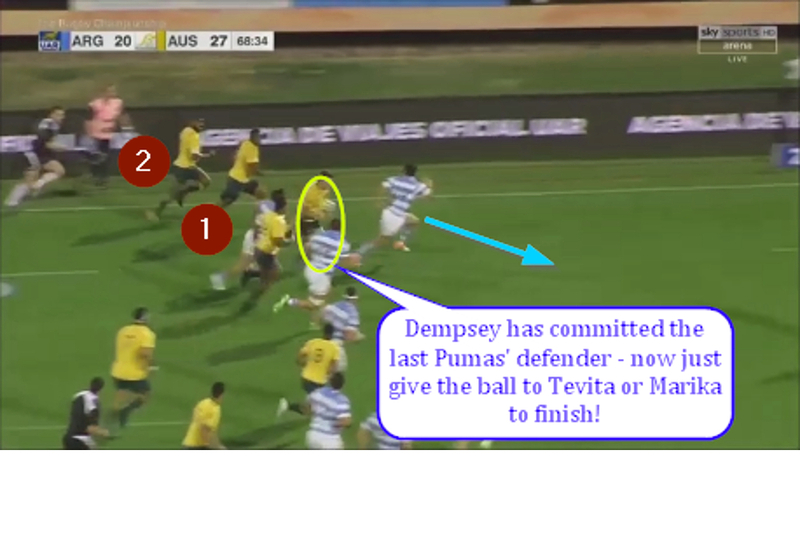 Again in the McMahon role from an Argentine KO, Dempsey then fumbled the ball forward, handing the Pumas a prime opportunity to climb back into the game at 20-30 down with nine minutes left on the clock. Jack Dempsey certainly appears to be a far better bet at #6 than Ned Hanigan, at least on the evidence of the Argentina game in the final round of the Rugby Championship. For parts of the game, he was outstanding, especially in the ball-carrying department. 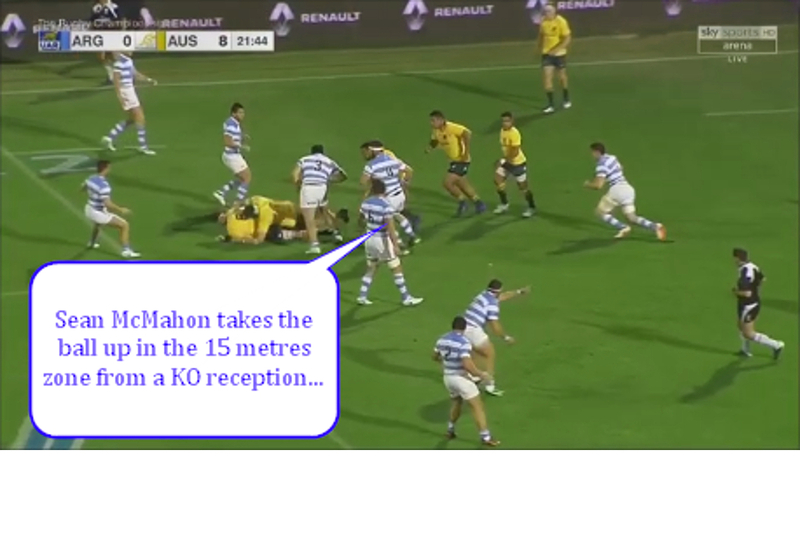 As a runner on the inside with Sean McMahon playing the wider role offensively, the combination was very effective. On the negative side, Dempsey faded badly in the last 15 minutes and was unable to handle the chores normally assigned to McMahon when he shifted to #8 – although that was probably the result of a faulty bench policy. Will Jack Dempsey be able to stand up and beat those other, much larger SOB’s with whom he is about to be confronted – Liam Squire this coming weekend, maybe Maro Itoje at Twickenham next month? 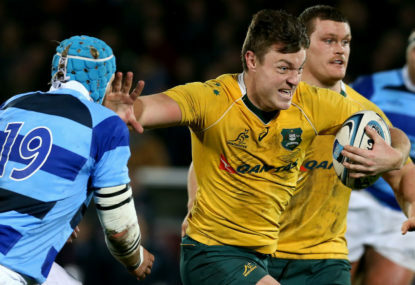 It is a challenge his namesake would have relished in the boxing ring, but whether Australia can get away with playing their small back-row against the giants of the contemporary game is another matter entirely. Will it turn out to be like putting Jack Dempsey into a mismatch with a heavyweight from another era, like Lennox Lewis or Larry Holmes? Or will the natural middleweight truly prove that he deserves a place alongside the titans of his position, and that size really doesn’t matter?